I’m sadly not there. But at least I’ll see many of the same folk in Philadelphia in August. That’s because they’re the same people. I stand to honor the promise the flag represents. You kneel because that promise has been broken. I stand to affirm my belief that all are created equal, and to fight alongside you for that promise. You kneel because too few stand with you. I stand because we can be better. You kneel to remind us to be better. I stand to honor all that have fought and died so that we may be free. You kneel because not all of us are. I stand because I can. You kneel for those who can’t. I stand to defend your right to kneel. You kneel to defend my right to stand. I stand because I love this country. You kneel because you love it too. 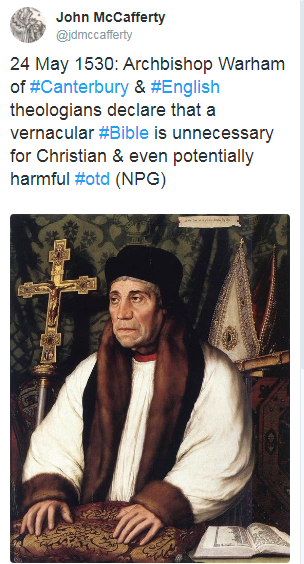 Putting the Bible into ill equipped ill informed hands only resulted in a grotesque and utterly insane string of unbiblical and theologically abhorrent nonsense from which the Church continues to suffer. Dilettantism hasn’t been a blessing for Christianity, it has been a curse. The alchemy of dilettanitsh interpretations turned the gold of Scripture into a poisonous lead concoction which kills those who imbibe it. 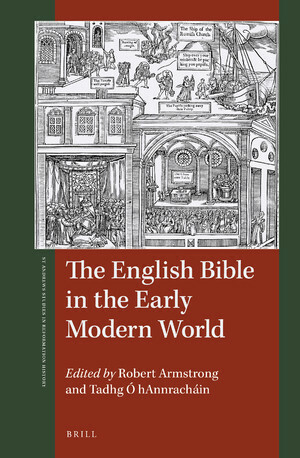 The English Bible in the Early Modern World addresses the most significant book available in the English language in the centuries after the Reformation, and investigates its impact on popular religion and reading practices, and on theology, religious controversy and intellectual history between 1530 and 1700. Individual chapters discuss the responses of both clergy and laity to the sacred text, with particular emphasis on the range of settings in which the Bible was encountered and the variety of responses prompted by engagement with the Scriptures. Particular attention is given to debates around the text and interpretation of the Bible, to an emerging Protestant understanding of Scripture and to challenges it faced over the course of the sixteenth and seventeenth centuries. More. Brill have sent a review copy. So watch for it. I’m going to try and livestream my St Mary’s conference paper tomorrow at 5.30pm UK time. It’s effectively a summary of the book. The first bit will be more of the same but the second half probably won’t be. In addition to Corbyn and the others, it’ll include what “perversion of Islam” means, why we love to hate the far right, Barrow > you, slagging off the Guardian, and the Bob Crow Brigade. Tune in on his Facebook page. That So Called First Century Fragment of Mark…. Isn’t from the First Century. So yet again the claims don’t match the reality.